Week of Geek: Can we talk about Venom for a minute? Hi again Geeklings! How’s November treating you? Well, we got some sad news from the world of Marvel last week. Stan Lee passed away at the age of 94. He was a cool guy. I had the pleasure of being in the audience when he made his last appearance at Fan Expo and he was delightful. He created amazing characters and touched a lot of lives. He’ll be sorely missed. We can all take comfort in knowing that his legacy is not going away anytime soon. Under Disney, Marvel is expanding ever outward in movies and TV shows. The comics are still a thing and other studios are creating movies as well. What Stan Lee helped create will be around for a long long time. Today I thought I’d talk about one of the stranger examples of a Marvel movie to come out this year. One that had everything going against it, and yet, and yet, has been a huge success financially. It’s inspired memes, a lot of head scratching and a rather unexpected ship. 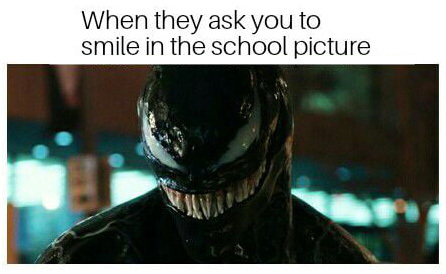 I of course speak of Venom. So first of all, who, or what, is Venom? In a nutshell, Venom is actually two characters, the alien creature known as Venom and whichever host he’s inhabiting. Venom is from a race of these almost liquid-like creatures that can inhabit a host body. With Venom, his host is reporter Eddie Brock (there have been other hosts in the comics, including Spider-Man himself, but Eddie is the go-to). A symbiote (the common name for what Venom is) can give it’s host a lot of super powers but it also has a mind and will of it’s own and, depending on it’s temperament, can cause a lot of damage and can full on eat people. Venom is a quintessential anti-hero. This big screen version was released back in October, and it was riding a wave of heavy skepticism and bad reviews. It’s currently sitting at 29% on Rotten Tomatoes which, if you know your percentages, is not good. But even before the reviews came in people were expressing disdain. First problem is that it’s a product of the deal Marvel and Sony made years ago where Sony acquired the movie rights to Spider-Man and his various properties. Since Sony now has an arrangement with Marvel Studios to use Spider-Man in the Marvel Cinematic Universe, Sony still has ownership of other Spidey-related characters, and they thought ‘Why not make a movie featuring just long-time villain Venom?’. A movie that features a well-known Spider-Man villain… but it doesn’t have Spider-Man. To a lot of people that just didn’t make any sense at best and at worst was downright sacrilege. Secondly fans were hoping the movie would have an R-rating… but that didn’t turn out to be the case, as it now has a PG-13 rating. Which is great for more people to watch it (including most of you guys) but it could also take the teeth (heh) out of the film. And it sounds like there were reshoots during it’s production, which is not always good for a film. So yeah, bad reviews, rough history, a lot of fan skepticism. Venom did not arrive in theaters with a lot of hope. But then something strange and kind of awesome happened. During it’s opening weekend Venom smashed box-office records, gaining the highest opening weekend in October to date. Remember that low Rotten Tomatoes review I mentioned? That was just for critics; the audience score is currently at 86%. Fan art emerged, the internet came up with a bunch of jokes. And the shipping, my gosh, the shipping, that was petty unexpected too. And just today I read that Venom is pegged to make more money globally than any X-Men movie to date, including Deadpool. Whaaaaaaaaaaaa? So what happened? How did this weird problem-prone little movie become such a hit? Well, that article I linked to about it surpassing the X-Men movies theorized that it’s because of brand value. Venom is an iconic character and so people will see a movie about him. I’m not so sure about that though, and if you look at the comment (there was only one at the time of this writing) written below that article the person posting thinks that it’s because Tom Hardy‘s take on both Eddie Brock and Venom was so entertaining that it overshadowed the rest of the movie. I went to see Venom actually, after I saw all the buzz on my favorite fan sites, and I have to agree with that poster, not just about Tom Hardy (who is a great actor, let’s not deny it) but about other components of the movie as well. Ya see, my knowledge of the character Venom is pretty slim. I watched the 90’s Spider-Man cartoon and he was one of the villains there. I never saw the third Sam Raimi Spider-Man movie where Topher Grace tried to play Brock/Venom, and from what I hear I’m not missing much. And I read about him a little in the comics. So yeah, I didn’t go into it as a hard-core Venom fan but I did know the broad strokes. And my take on the movie? It was not a good movie, not by any stretch, but darn if it wasn’t fun. Eddie was a surprisingly relateable character, just kind of a doofus who genuinely wants to do good but often times messes it up. And Venom is… well, Venom. But the two of them learn to work together, and it actually gets kind of adorable between the two during the last act. There were some funny moments, some good action scenes and… yeah, it was just fun. And sometimes that’s all a movie has to be. Just fun. Clearly it’s struck a nerve with a lot of people, and now there’s a good chance a sequel will happen. Maybe we can even hope for that crossover with Spider-Man. One last minor point; I’m really glad they changed the pronunciation of ‘symbiote’ in the movie. Yeah, it’s a made-up word, but every time I’ve heard it spoken in a Marvel property they’ve always pronounced it as sym-BEE-ote. One of the early trailers for Venom tried to pronounce it sym-BYE-ote. It just sounded wrong to me. But when I saw the movie it was back to the original sym-BEE-ote. Thanks Marvel/Sony! Also, this was my favorite bit of dialogue. What a power move! Anyway, did any of you guys see it? What did you think? Post away in the comments below. Have a great week guys, and until next time, End of Line.